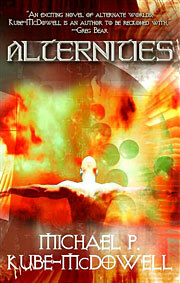 Kube-McDowell, Michael P. Alternities . Ace 1988. 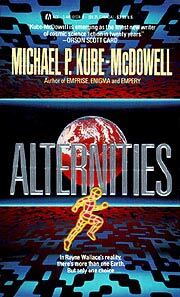 Kube-McDowell, Michael P. Alternities . iBooks 2005. What if: Dwight Eisenhower was killed in a plane crash in January 1951, and Robert Taft was elected president in 1952, beginning a course which resulted in a more isolationist, reactionary America. Summary: In the late 1970s, the government secretly exploits a mysterious route to a half dozen alternate Earths for technical gain. As a showdown with the Soviet Union becomes imminent, plans are laid to use one alternate as a bolthole for elite politicos. Published: Ace 1988 (0441017746BUY); SFBC 1989; Sphere 1989 (0747404585); iBooks 2005 (0743497805BUY).